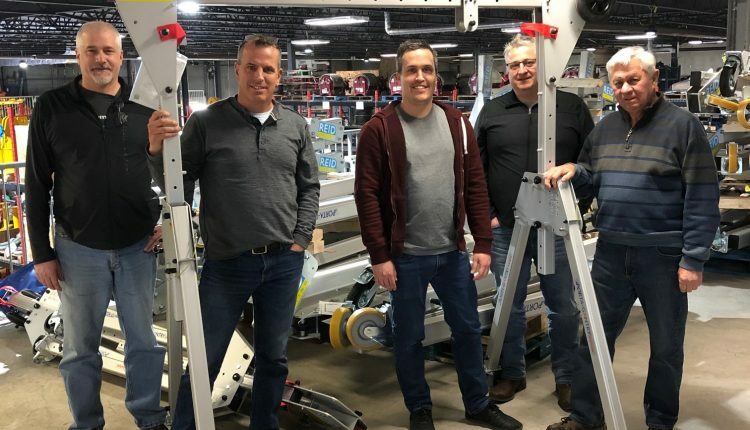 The UK’s Reid Lifting, a manufacturer of lightweight gantry and davit cranes, has redoubled efforts to target the Canadian market through Equipment Corps, of Stoney Creek, Ontario. Equipment Corps had previously consumed the Canada-based stock of the Chepstow, Wales manufacturer, but Reid has sharpened its focus on the key marketplace and shipped its second container of new equipment to the strategic partner. The latest shipment included the popular Porta-Gantry and, notably, four 1,000kg capacity Porta-Gantry Rapide units, in addition to lifting accessories. In totality, the 40-ft. container included equipment ranging from 500kg to 5,000kg in capacity. Equipment Corps has two facilities—the other is in St. John’s, Newfoundland, Canada—and 35 employees. It specializes in the provision of industrial and construction tools, in addition to fabrication equipment. A broad portfolio already included Reid gantries, having stepped in to take the fleet of a previous partner that chose to leave the market.